Berberine is an isoquinoline alkaloid with a bright yellow color that is easily seen in most of the herb materials that contain any significant amount of this compound. 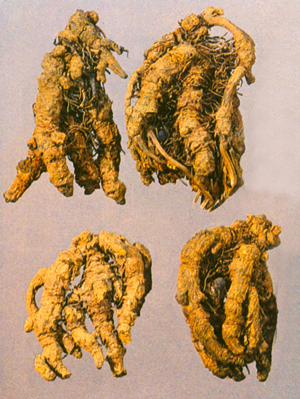 Among Chinese herbs, the primary sources are phellodendron and coptis (similar isoquinoline alkaloids, in these herbs, such as jateorrhizine, coptisine, palmatine, and columbamine, also have a yellowish color). Berberine has long been used as a dye; it is currently known as “natural yellow 18,” being one of about 35 yellow dyes from natural sources. Coptis chinensis rhizomes (huanglian; literally “yellow thread”) and related species used as its substitutes have about 4–8% berberine, while Phellodendron amurense bark (huangbo, literally “yellow bo,” where bo is this particular type of tree) has about half as much, at 2–4% berberine. 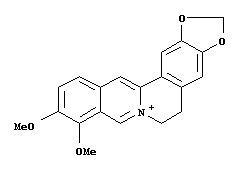 This compound is also found in the less commonly used Chinese herb sankezhen (B. sargentiana) and in the Japanese barberry (woody portion of Berberis thunbergii). All of these herbs are known as therapies for damp-heat syndromes, particularly for intestinal and lung infections, and they are used topically for various skin diseases. Several Western herbs also contain berberine, such as barberry root bark (Berberis vulgaris), Oregon grape root (Berberis aquifolium), and goldenseal root (Hydrastis canadensis). 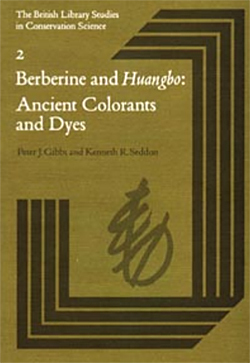 Berberine was isolated and used as an herbal drug in China 50 years ago (the drug forms are usually the hydrochloride or sulfate; the chloride, as used in the dye, may have the strongest antiseptic action). It has since become an ingredient in several Western herbal products, particularly for treatment of intestinal infections. 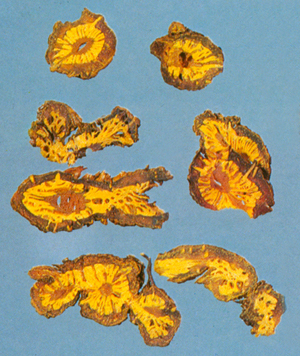 Coptis rhizomes; whole (left) and sliced for use in making decoctions (right). Coptis and phellodendron have been used in China for treating gastrointestinal diseases with reported success; applications have included acute gastroenteritis, cholera, and bacillary dysentery. So, the first applications of isolated berberine were for treatment of these conditions. Recent clinical trials have yielded conflicting results as to which of the disease organisms causing intestinal symptoms are responsive to berberine (1, 2). Tests of the antiseptic action of berberine against bacteria, yeasts, viruses, and amoebas have shown a range of activity levels from apparent potent action to mild suppression. Inhibition of giardia and of candida have been areas of considerable interest and initial positive research results have led to development of several herb products for those applications. Soon after berberine was prepared as an isolated agent for clinical use, it was noted that berberine had other potential benefits; for example, it appeared to reduce high blood pressure at doses of about 1 gram per day (3). The hypotensive action of berberine has been confirmed in several pharmacology experiments, but follow-up clinical trials have been lacking. Still, this effect of berberine fortunately led to further testing of the compound for patients with cardiovascular disease risk factors, and evidence developed to demonstrate a lowering of cholesterol (and triglycerides) and of blood sugar. These new findings are the main focus of this brief report. There has been increased interest in lowering blood cholesterol, and especially LDL-cholesterol, as a means of curtailing the high rates of heart attack and stroke. In addition to recommended dietary changes, many people are prescribed statin drugs for this goal. The statin drugs are powerful, frequently effective, and may have other benefits, though they also pose certain risks. During the 1990s, the Chinese herb material “red rice yeast” (Monascus purpureus) was sold in the U.S. as a natural supplement that contains, as one of its active ingredients, small amounts of lovastatin, one of the widely used statin drugs (it also contains several related compounds that contributed to the cholesterol lowering action). After prolonged legal disputes between the supplement providers, the drug companies, and the FDA about its content of the drug substance, the sale of red rice yeast and its extracts as natural cholesterol lowering agents was banned. It was reported recently that berberine lowers cholesterol through a mechanism different than that of the statin drugs, suggesting potential use both as an alternative to the statins and as a complementary therapy that might be used with statins in an attempt to gain better control over cholesterol. In a controlled Chinese study (4), it was shown that berberine, administered 500 mg twice per day for 3 months, reduced serum cholesterol by 29%, triglycerides by 35% and LDL-cholesterol by 25%. The apparent mechanism is increasing the production of a receptor protein in the liver that binds the LDL-cholesterol, preparing it for elimination. Dietary therapy was first introduced to the patients for one month. For those who still had high fasting blood sugar, berberine was administered orally at a dose of 300, 400, or 500 mg each time, three times daily, adjusting the dosage according to the blood glucose levels; this treatment was followed for 1–3 months. A control group without diabetes was similarly treated, with no effect on blood sugar. For the diabetic patients, it was reported that patients had less thirst, consumed less water and urinated less, had improved strength, and had lower blood pressure; the symptoms declined in correspondence with declining blood glucose levels. Laboratory studies suggest that berberine may have at least two functions in relation to reducing blood sugar: inhibiting absorption of sugars from the intestine and enhancing production of insulin. As relayed by Ni in his review of the literature, clinical experience with berberine has shown that doses of 2 grams per day produced no side-effects. Rabbani GH, et al., Randomized controlled trial of berberine sulfate therapy for diarrhea due to enterotoxigenic E. coli and Vibrio cholerae, Journal of Infectious Diseases 1987; 155(5): 979–984. Kaneda Y, et al., In vitro effects of berberine sulphate on the growth and structure of Entamoeba histolytica, Giardia lamblia, and Trichomonas vaginalis, Annals of Tropical Medicine and Parasitology 1991;85(4); 417–425. Chang HM and But PPH (editors), Pharmacology and Applications of Chinese Materia Medica, (volume 2), 1986 World Scientific, Singapore. Kong Weijia, et al., Berberine is a novel cholesterol-lowering drug working through a unique mechanism distinct from statins, Nature Medicine 2004; 10(12): 1344–1351. Ni Yanxia, et al., Therapeutic effect of berberine on 60 patients with non-insulin dependent diabetes mellitus and experimental research, Chinese Journal of Integrated Traditional and Western Medicine 1995; 1(2); 91–95.